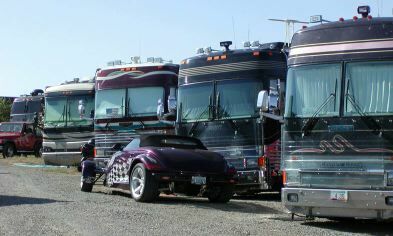 Your Rally of 10-55 RV's is welcome at Santa Fe Skies RV Park. Please inquire soon if you would like to schedule for 2018 or anytime between August 1 and October 15. There is more flexibility the rest of the year. Subject to prior bookings, you are welcome to use our visitor center with a theater lounge (giant movie screen), meeting room, patio area and kitchen for happy hour/potluck/catered meals/presentations and other agreed upon activities. A cleaning deposit may be charged. Preferably six weeks in advance, please try to send us your list of rally members with the size and type of RV's, plus a 10% deposit, which will be credited towards your total upon arrival. It is refundable unless you cancel less than 15 days before your scheduled date of arrival. Most rally groups collect from each of their participants and pay us upon arrival. However, we can handle payments if you have your participants call in a credit card number. Early arrivals/stayovers may have the rally rate by making advance reservations. Thank you for considering Santa Fe Skies RV Park and we look forward to hearing from you!